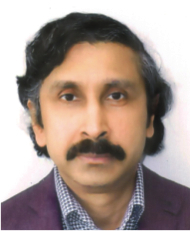 Sutapas Bhattacharya was born, of Bengali parents, in Guwahati#, North-Eastern India in 1964. His family moved to London, England in 1967 when he was two. His formal education led to a First Class Honours Degree in Molecular Biology from the University of London in 1986 including prizes for being the top student in the School of Biological Sciences in his college in both the 2nd and Final Years. His course supervisor Lorna Casselton later became Vice President of the Royal Society. In 2009, on learning about his identification of the physical correlate of the Pure Consciousness, she commented that he seemed to be “making your mark on the world as we [the academics who taught him] expected” *as well as inviting him to visit her at the Royal Society. #Guwahati (previously Gauhati) was in medieval times known as Pragiyotishpur or "The Light of the East". *(Given the profound implications of Sutapas’ identification of the physical correlate of Pure Consciousness in undermining the metaphysical basis of Western science, - which Sutapas had highlighted in his initial communication to her in 2009, the basic acknowledgement of the overwhelming evidence supporting his physical correlate as ‘making your mark on the world’ is quite something in itself). Indeed, at age 18 in 1983, even before starting university, Sutapas had published a metaphysical paper purporting to explain the problem of the Ontological Status of Consciousness which won him the praise of distinguished professors of Philosophy. Whilst working for a major international Scientific Publishing Company in 1994, he identified the physical correlate of the Divine Light (or Pure Consciousness) with the brainwaves from the Brainstem Reticular Activating System (RAS) – this is the first ever (and still remains the only ever) identification of a physical correlate of Consciousness – indeed of the so-called Pure Consciousness (not recognized by Western Philosophy and Science) or the Divine Light or Godhead, which is the central element of all True Spirituality. In fact, modern Medicine already recognizes the brainstem Reticular Formation which controls the RAS activity as being the prerequisite for any form of Consciousness in humans. Sutapas went on to show how the entire Physicalist picture of Western Science could be integrated into the bigger, deeper transcendentalist metaphysical picture of Indian Yogic mysticism in his book The Oneness/Otherness Mystery: The Synthesis of Science and Mysticism. This book was published in 1999 by Motilal Banarsidass, Delhi who are the most prestigious publishers of Indian Philosophy and co-publish with Princeton U.P. The Encyclopedia of Indian Philosophies series. However, the Sanskrit- obsessed, scientifically-illiterate academics in Indian Philosophy have largely ignored Sutapas' revolutionary work which finally resolves the great central problems. No doubt that such scientific-takeover of the study of Mysticism & Spirituality threatens these linguist & Humanities academics, posing as philosophers, with the prospect of irrelevance and redundancy as a modern, scientifically-literate audience will no longer want to read yet more speculative (and largely false) interpretations and translations of ancient texts* when the authoritative scientific interpretation is readily available! * It has been the non-academic gurus such as Vivekananda (who befriended William James and Nikola Tesla), Aurobindo Ghose, TM-founder Maharishi Mahesh Yogi , Gopi Krishna (who befriended Carl von Weizsacker) and Jiddu Krishnamurti (whom David Bohm befriended) who have led efforts toward scientific corroboration of yogic phenomenology and metaphysics although, as stated on other pages of this website, this has largely resulted in pseudoscientific misinterpretations. #Drawing upon the work of physicist Milo Wolff and others, BBAB undermines such anthropomorphic Theistic myths by showing that the Nonlocal, Holonomic Wave Structure underlying Matter (or stable spatio-temporal forms) can also account for the self-organization of law-like universal regularities (which the Christian West described anthropomorphically as 'Laws of Nature' (originally conceived as laid down by a Christian Creator God possessing miraculous powers) and as Physical Constants). Indeed, Transcendental Holonomy can explain the very fact that such 'lawlike' behaviour operates universally as it supplies the underlying coherence, or interconnectedness of all phenomena, which is presupposed tacitly in any such notion of 'Universal Laws of Nature'. The Union Minister of Education in India during 2000 Maharaj Kishen Kaw was excited by Sutapas’ book having himself called for a scientific understanding of Spirituality in a small book in 2000. Sutapas upstaged all the 'big name' New Age speakers at the August 1999 Beyond the Brain conference held at King's College Cambridge, sponsored by the SMN and the US Institute of Noetic Sciences (‘IONS’ founded by Apollo 14 astronaut (and physicist) Dr Edgar Mitchell) when the final audience question from a woman in the audience at the final panel discussion session was “There is a person in the audience called Sutapas Bhattacharya and he knows a lot more than any of you speakers and we should all hear what he has to say”. **Most of the US professors of Hinduism and Buddhism who discussed Wilber on the Infinity Foundation's YogaPsychology web forum in 2000 agreed that he has largely copied his 'Integral Psychology' from Sri Aurobindo's 'Integral Yoga'. Wilber also repeats the pseudoscientific myth peddled by Aurobindo (copied from Romanticism) of the Evolution of Consciousness which is undermined by the RAS-brainwave correlation and Sutapas' fact-based 'Retreat-to-the-brainstem' interpretation of Enlightenment. **Ironically the late president of IONS Professor Willis Harman (who died in 1996) had called in his New Metaphysical Foundations of Modern Science for US New Agers to learn from Indians as Indians had studied Consciousness for thousands of years. Harman, an ex-professor of Electrical Engineering at Stanford and ex-Director of Stanford Research Institute, had also predicted that the Science of the Future would be based on Indian metaphysics with its Primacy of Consciousness and Transcendentalism. Sutapas had worked out the philosophical foundations for this New (Consciousness-based) Science. The likes of What is Enlightenment magazine and journals such as Zygon (supposedly about Science & Religion) also ignored Sutapas' book in spite of amazing letters praising it from distinguished professors. Also in 2000, after meeting him at a US conference, Rajiv Malhotra** founder of the Infinity Foundation in Princeton, New Jersey offered Sutapas sponsorship to get a PhD at a top US University. Rajiv had first seen O/OM whilst visiting the famous PEAR Psychokinesis research lab at Princeton run by the ex-Head of Aeronautical Engineering at Princeton, Professor Robert Jahn. Jahn had tried to get O/OM reviewed by a US fringe science journal but (probably due to the unusual mix of personal narrative, history, politics, poetry and metaphysics) this did not happen. Rajiv felt that Sutapas might get his views heard in Western academia if he became an academic himself. But given the deteriorating condition of his elderly mother, who had Parkinson’s Disease, Sutapas knew that the burden of care would fall on him, given the lack of concern shown by his three brothers (they had no extended family in The UK). Also, given the takeover of Sutapas’s employer by another large publishing empire, he was hoping to be getting a large redundancy payment in the near-future, so he turned down Rajiv’s offer. In truth, Sutapas knew that no PhD specialist could possibly undertake the integration of the whole of human knowledge into one coherent ontology that he was undertaking. Academic specialists learn more and more about less and less and Western academia simply would not have allowed him to do what he wanted. Who in the world could have supervised Sutapas whose first book O/OM acknowledged only one teacher, his Deeper Self (the impersonal spirit or Atman) which had driven him on toward his destiny through compulsions, insights and synchronicities. Having finally got the large redundancy pay-off in August 2002 Sutapas was soon forced to become his mother’s full time carer in November 2002 when his mother lost her independence due to dystonia induced by wearing-off effect of l-dopa and numerous other medical complaints occurred soon after. Thus Sutapas had to wait until 2006, after her death, to resume his plan to rewrite his Science-Mysticism synthesis for a Western audience. This involved turning down an offer for a US publication from Paragon House in 2003 given the pressure of caring for his mother. However, prominent US New Ager John White (Ken Wilber’s original Literary Agent, and Literary Agent for Amit Goswami) who had reviewed Sutapas’s proposal for Paragon House (where White had been the publisher in the past) saying it would be a ‘landmark work’ remained in contact, acting as Sutapas Literary Agent in 2012 when Sutapas approached US/UK publishers with BBAB. **Malhotra's own focus is on what he labels as the 'U-Turn'. This is based on his experience of Western New Agers (many of whom he sponsored) learning from Indian Philosophy (Hinduism and Buddhism) and then later reformulating Indian ideas and practices in Western and Christian clothing, suppressing the use of Sanskrit terms and references, in order to pander to the prejudices of White society. Although Sutapas introduced Malhotra to the SMN in 2000 resulting in Malhotra providing the SMN sponsorship for its 2001 'Beyond the Brain' conference, note that the SMN did not invite Sutapas to speak (having stolen the show from the academic speakers at the end of the 1999 conference). In 2018, Malhotra was made a Visiting Professor at JNU in Delhi. Rather than rush, Sutapas spent his own savings on slowly researching over 6-7 years the background knowledge from numerous diverse fields, especially Continental European Phenomenology, Cognitive Science, Consciousness Studies, the metaphysical interpretation of Quantum Theory, Ancient Greek philosophies, Western Esoteric traditions, Comparative Religion etc. to produce his new work The Brainstem Brainwaves of Atman-Brahman: The Synthesis of Science and Spirituality. During this time he also discovered much more evidence confirming his RAS correlate of the Divine Light and began to understand how his discovery allows us to interpret Western esoteric and Christian mythology symbolizing spiritual transformations in scientific terms. In fact, as indicated in Freke and Gandy's 1999 book (discussed on the Homepage of this website), the central mystical teachings of the Mediterranean Mystery Religions (whose myths were copied by the Hellenized Jewish Gnostics in order to concoct the mythical story of 'Jesus' as a Jewish Mystery Religion) are essentially the same as the Vedantic doctrine of the Atman-Brahman. Whilst preparing this work in 2008, Sutapas prepared a scathing critique of Professor Lewis Wolpert’s 1996 book The Unnatural Nature of Science – the book Professor Richard Dawkins had heaped praise upon at the 1996 UK Publishers’ Association Centenary Conference*. Sutapas showed that Wolpert’s central arguments rehashing the supposed “Greek Miracle” in Philosophy and Science were in fact Eurocentric myths created by Colonial White Supremacist Classics in the 19th Century. In fact Ancient Indian achievements in Philosophy and Mathematics were superior to those of the Greeks. He copied his critique to Wolpert who acknowledged it and also got praise from the likes of Professor Martin Bernal (author of Black Athena: The Afroasiatic Roots of Classical Civilization) and Professor J.M. Hobson (author of The Eastern Origins of Western Civilization, CUP). * Dawkins had simultaneously lambasted the publishing of "mystical pseudoscience" books which filled the shelves of many bookshops. In fact, Sutapas would agree with Dawkins that most of these New Age books are pseudoscience. As discussed on my Western Academic Racism page, Wolpert's book rehashes Western Classics' fabrications of Ancient Greek mystics (shamanic healers deeply involved in Occult practices and who also believed in reincarnation - practices and beliefs which Wolpert lambasted in other traditions) as if they were 'scientists'. Similarly in 2008, Sutapas exposed the errors and false reductionism in the late ‘neuro-phenomenologist’ Francisco Varela’s Brain Dynamics model of the mind (ego) based on the Phenomenology of Edmund Husserl presented in Varela’s protégé Evan Thompson’s Mind in Life (Harvard U.P.). Sutapas pointed out that Varela’s friend the Dalai Lama had made a clear distinction between the Inner Light (whose physical correlate Sutapas had identified) and the ego mind which Varela had chosen to ignore just as Varela had ignored the similar distinction between the Ego and the Absolute Consciousness (actually the Inner Light) in Husserl’s phenomenology. Sutapas’ critique drew positive comments from the late Varela’s old colleague, Historian and Philosopher of Science Michel Bitbol, whose own Eurocentric suppression of Erwin Schrödinger’s Indian Vedantic philosophy Sutapas had also exposed. * Bitbol admitted that they had been “too shy” to challenge the dominant Western metaphysics. * The Brain Dynamics researcher Scott Kelso also responded positively to Sutapas’ critique asking for more information. ​*Bitbol had written the Foreword to the 1995 Oxbow Press reprint of Schrödinger's The Interpretation of Quantum Mechanics in which Bitbol claimed that Schrödinger's Idealist ideas came from the influence of Ernst Mach. Bitbol cited Schrödinger's My View of the World as the source for this assertion. Yet in his My View of the World (which Oxbow Press had reprinted with a Hindu-style orange cover and Hindu-style 'Eye-of-Wisdom' on the front cover) Schrödinger had once-again stressed his advocacy of the Indian Advaita Vedanta (nondual Brahmanism) metaphysics as the primary source of his metaphysics and made no mention of Mach! ​*In fact, in his book Mind in Life, Thompson reassures his readers (assumed to be Physicalists) that he has not ventured beyond Physicalist metaphysics [an example of what Sutapas labels in BBAB as 'Physics Appeasement' in Western academic philosophy]. Simultaneously, Thompson laments that the so-called 'Hard Problem' [a new label for the old problem of the Ontological Status of Consciousness] seems impossible to resolve. It is of course impossible if you limit yourself to Physicalism for fear of upsetting mainstream Western beliefs! In 2010 Sutapas watched the first episode of the 2004 BBC TV series Light Fantastic presented by Cambridge University Historian of Science Simon Schaffer. Schaffer peddled Eurocentric falsehoods about Greek culture supposedly dominating India and he also claimed that Isaac Newton’s work on Optics had discredited the "ancient myth" of Divine Light. Unable to find Schaffer's contact email, Sutapas complained to the BBC about these falsehoods showing his evidence confirming the physical correlate of the Divine Light. The Executive Producer of Light Fantastic, Anne Laking, wrote back saying that she had read both the evidence and the free draft chapters from Sutapas’ work-in-progress The Brainstem Brainwaves of Atman-Brahman which were then available on-line. This had even prompted her to buy Sutapas' The Oneness/Otherness Mystery which she was going to show to colleagues in the BBC Science Department. Of course, individuals in such mainstream British institutions will not dare to publicize such ideas undermining the root mythologies peddled by Britain's most famous scientists past and present. BBAB mocks the, actually absurd, comments made by many BBC Science (and non-Science documentary) presenters who are lauded by the mainstream British media**. This reflects the institutional-racism of British academia which has been at the forefront of demonizing India's indigenous traditions (see Western Academic Racism page)**and peddling the White Supremacist myth of the 'Greek Miracle' etc. ​**Max Muller wrote of the British Indologist Colebrooke (who demonstrated the Hindu origins of Modern Algebra - see Western Academic Racism page) that, had Colebrooke been a German his name would have been celebrated throughout academia. But in England, there was "Not one word". ​** Mainstream British culture is notorious for its hostility to mystical and metaphysical thought (in stark contrast to Germany and even to France). This is exemplified by Dr Samuel Johnson's claim to 'refute' the Idealism of Bishop Berkeley by simply kicking a stone. Thus the hostility and total lack of any institutional support for Sutapas' work in Britain is not that surprising. John Locke wrote that early Protestant enthusiasts were deluded in claiming to experience an Inner Light. Even in 2016 the (supposedly 'intellectual') BBC 4 has a TV Science documentary series The Brain with David Eagleman in which US neuroscientist Eagleman glorifies the (Kabbalist) pseudoscience of the fraud and charlatan Sigmund Freud (who was not the pioneer of the 'Unconscious' as is claimed). Freud's fraud and countless falsehoods [ BBAB quotes a US National Academy of Science book stating that not a single Freudian Psychoanalysis concept including unconscious repression has any scientific evidence to support it] have been exposed by real scientists including his misdiagnosis and mistreatment of child abuse victims in terms of absurd notions such as the Oedipus Complex! As stated on the Homepage, Leftist Cult hero (Slovenian) Slavoz Zizek makes repeated references to (pseudoscientific) 'Psychoanalytic Theory' as if it is some profound set of truths! It is perhaps not surprising that on a 2015 episode of the BBC political debate Question Time, right-wing celebrity historian David Starkey tried to show off his supposed erudition by asking another panellist if she had not read Freud!! !